One of the great things about Mother Nature is her eagerness to experiment with her many offspring to help them survive in an ever-changing world. Now and then she even encourages two closely related species to trespass on each other’s territory and in the process creates a natural hybrid between them. Two of the most impressive of the large-flowered Cattleya species, the yellow-petal Cattleya dowiana aurea and the large, richly colored purple, Cattleya warscewiczii, grow in the dense jungle reaches of the mighty Andes Mountains of Colombia. They have flourished there for centuries, living happily in their own specialized and separated areas. In an occasional spot, however, they have encroached in a small way on each other’s home ground and, although the two species flower at slightly different times of the year, a few plants flowered closely enough together that an overly eager bee took the pollen from a flower of one species and deposited it on the flower of the other species. 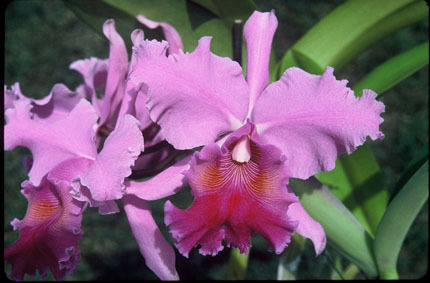 The resulting hybrid was one of nature’s masterpieces, Cattleya hardyana. C. dowiana aurea and C. warscewiczii were imported in great numbers into Europe during the 1870s, 80s and 90s. In one instance in1880, an Englishman named George Hardy asked a friend to buy him some Cattleya warscewiczii at Steven’s Rooms in London. The plants had been collected by a plant hunter working for Sanders’ Orchids in St. Albans and were to be auctioned the next day. Hardy’s friend obligingly bought the plants and delivered them to Hardy’s estate, Pickering Lodge, in Cheshire where they grew happily and eventually flowered. In August 1884, however, one of the plants flowered that was clearly not a C. warscewiczii. The plant looked like C. warscewiczii, but the flowers were not like any large-flowered Cattleya species anyone had ever seen.. Since the original group of plants Hardy bought came from an area in Frontino, Colombia where C. warscewiczii and C. dowiana aurea were known to grow together, people began to suspect the strange plant was a hybrid between the two species. The physical appearance of the plant and its growth habits were similar to C. warscewiczii, but the flowers, although lavender in color, had many characteristics of C. dowiana aurea. Instead of distinct yellow eyes like C. warscewiczii, there were large “blotches” of yellow on the sides of the lip and the disc was “reticulated with deep yellow nerves as in C. dowiana aurea.” The flowers also had a strong dowiana-like fragrance. Only one plant in the group of cattleyas Hardy bought had these characteristics. The rest were just normal C. warscewiczii. C. warscewiczii is one of the parents of C Hardyana and gives the primary hybrid tall pseudo-bulbs and flat petals. George Hardy had one of the most well known orchid collections in England during the 1880s. He specialized in the large and showiest orchids - cattleyas, laelias and odontoglossoms. James O’Brien, secretary to the orchid committee of the Royal Horticultural Society had visited Pickering Lodge in 1883 and written a long glowing article about the collection in the Gardeners’ Chronicle discussing the outstanding condition of the cattleya plants. They were very vigorous, insect-free and had enormous pseudobulbs which O’Brien thought might come from some unknown fertilizer used by Hardy’s grower Mr. Holmes. 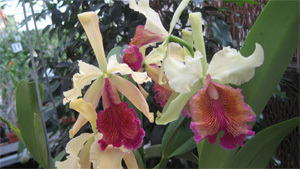 Holmes, however, said he used no fertilizer on his cattleyas and attributed their excellent condition to the “fine air and water of the area.” With so much publicity surrounding Hardy’s collection, the whole orchid world knew about Cattleya hardyana as soon as it appeared at Pickering Lodge. B. S. Williams had just completed the 6th Edition of The Orchid-Growers’ Manual in 1885 and he added an Addendum to it at the time of publication just to describe Cattleya hardyana. Hardy’s plant was pictured in 1886 in full color in plate 231 of Volume V of The Orchid Album and the plant was discussed by various writers in the Gardeners’ Chronicle. Hardy’s plant became so well known that when another C. hardyana appeared in the collection of M. le Duc de Massa in France in 1889 that had a strikingly different lip pattern, Williams’ pictured it in plate 362 of Volume VIII of The Orchid Album under the name, “Cattleya Massaiana,” despite the fact that its parents were C. warscewiczii and C. dowiana aurea..
Once orchid growers realized the only source for C. hardyana were the importations of C. warscewiczii, they began to pay premium prices for C. warscewiczii at auctions when the plants came from an area where they grew together with C. dowiana. Cattleya hardyana was always a scarce plant in the jungle and auction prices in London at times became astronomical. C. hardyana was never abundant in orchid collections until the advent of man-made hybrids which did not appear until the early 1900s. Imported plants had varying shades of lavender in the petals, from pale rosy-pink to rich deep purple, but a semialba appeared in 1892 in the collection of Thomas Statter, Stand Hall, Whitefield, Manchester, England. The variety was called C. hardyana ‘Statteriana’ and it received a First Class Certificate from the Royal Horticultural Society when it was exhibited on September 20, 1892. It had white sepals and petals with the lower third of the lip purple and generous mounts of yellow above it. Statter exhibited a second semialba at the September 11, 1894 meeting of the Royal Horticultural Society in London that had white sepals and petals and a solid dark purple lip with only thin yellow lines in the throat. The second clone also received a First Class Certificate and was called C. hardyana ‘Countess of Derby.’ A third semialba appeared in the collection of W.J. Robertson of Ardenholm Cheshire, England which was exhibited in 1895 and had white sepals and petals and a lip similar to Hardy’s original plant. In 1896 a semialba C. hardyana was pictured in plate 2 of the Dictionnaire Iconographique des Orchidees under the name “Cattleya dowiana aurea alba.” The semialba form of C. hardyana, while scarce in the jungle, is common in cattleya collections today. It is easy to make the hybrid because there are fine semialba C. warscewiczii available like ‘F.M.B.’ and ‘Augusta Victoria’ and C. dowiana aurea’s yellow color is so recessive it disappears in any semialba. The semialba was remade by a number of commercial orchid firms over the years and the breeding produced some outstanding clones like Bracy’s and Kensington’s xxxx which are pictured here. The semialba is probably the most popular form of C. hardyana today. One of the rarest color forms of Cattleya hardyana has pale yellow sepals and petals, and only two plants like this have been found to my knowledge. The first appeared in 1897 in the greenhouses of Linden in Brussels, and was christened variety ‘Reginae.’ The other clone, ‘Clement Moore’, is pictured in this article and is still found in private collections in the United States. Linden included a picture of ‘Reginae’ in plate DCVI of his famous book, Lindenia. Both ‘Reginae’ and ‘Clement Moore’ have remarkably fine shape for a primary cross like C. hardyana. C. hardyana is most famous, however, for its beautiful glowing purple varieties which were pictured in the grand old books of the late 1800s like Reichenbachia, The Orchid Album, and Lindenia. Sadly, these varieties do not seem to exist in cultivation any longer and can only be seen in the old prints from the 1800s. An occasional commercial orchid grower has remade the lavender C. hardyana, but I have not seen any plants from these crosses that are as beautiful as the old jungle plants. Cattleya hardyana has had a tremendous impact on the breeding of cattleya hybrids and crosses using it as a parent number in the hundreds. Some of the most famous include Cattleya Peetersii ( x labiata), C. Cooksonii (x trianaei), C. Mrs. Fredrick Knollys (x mossae), C. Princess Royal (x Fabia) and Bc Heatonensis (x B. digbyana). It was a key ingredient in the development of our modern fine large purple Cattleya hybrids and appeared in the early building block hybrids, Lc. St. Gothard (1908), Lc. Sargon (1915), Lc. Profusion (1922) and Lc. General Maude (1917). As you would expect, C. hardyana was crossed back on its parents C. dowiana aurea to make C. Prince John (1913), and C.warscewiczii to make C. Eleanor (1918) both of which produced remarkably fine flowers. C. Eleanor was even a semialba. Cattleya hardyana imparts excellent plant vigor, floriferousness, large flower size, and bright lip color to its hybrids and without it, most of our modern-day large-flowered purple hybrids would be a drab lot indeed. Its contribution to large flower size stands out in hybrids like its cross with Lc. Cuesta which is suitably named Laeliocattleya Superman. Since Cattleya hardyana is a naturally occurring hybrid, you have to instinctively ask what happens when a plant of C. hardyana in the jungle crossbreeds with either a neighborly C. dowiana aurea or a friendly C. warscewiczii ? As jungle plants, the offspring will undoubtedly be accepted as straight Cattleya hardyana by the orchid experts – and Mother Nature will simply wink an eye and smile. Cattleya hardyana is a vigorous, easy to grow plant that requires only normal cattleya care. 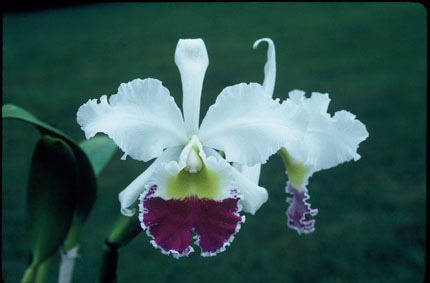 It likes lots of sun and moving air and should be treated essentially like Cattleya warscewiczii. It begins growing in early spring in the United States and, like C. warscewiczii, buds emerge from the sheath before the new growth is fully mature. The flowers open in early August. Like both parents, it is a mountain-type cattleya that likes warm days in the 80sF and cool nights of 58 F. It is generally a more reliable bloomer than C. warscewiczii. C. hardyana should only be repotted when it begins sending out roots from the newest pseudobulb which usually occurs just after flowering.